ENTER TO WIN A 1 year FREE MEMBERSHIP! Enter daily for your chance to win 12 months free membership to EoS Fitness! 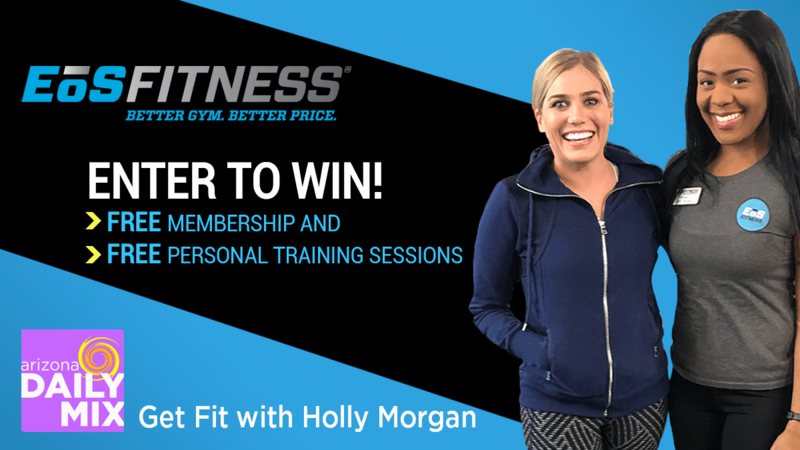 On Monday, April 15, 2019 one winner will be selected to win a 1 Year Membership plus 6 Personal Training Sessions at any participating EOS Fitness within the KAZT-TV ( Channel 7) viewing area. • Go to aztv.com and fill out the daily contest entry form. • Enter each day during the Sweepstakes window to increase your chances to win. *Note: Be sure to hit submit regardless of the method you use to enter. 12 month Free Membership plus 6 Personal Training Sessions at any EOS Fitness located within the KAZT-TV viewing area. The prize is valued at approximately $1,600. Starting March 11, 2019 at 8a, enter online until April 15, 2019 at 11:59 pm at aztv.com/win for your chance to win. One entry per eligible person, per day during contest entry period. Winner will be randomly selected by KAZT contest software. Winners will be drawn after the close of the contest signup period and notified via email. Enter every day of the sweepstakes to increase your chances of winning. Incorrect or incomplete entry forms are void. Open to legal US citizens located in Arizona. Winner is responsible for providing accurate contact information and will be notified via email or phone. Winner must claim their prize by 4:00 pm on Friday, April 30, 2019 and must present photo identification. All winners must be age 18 or older. Only valid for one winner per household. Prize is not transferable to another person. Prize components cannot be substituted. Winner is responsible for all local, state and federal taxes incurred on the value of the Contest Prize. An IRS Form 1099-MISC will be completed and filed with the IRS by AZTV for any prize valued at $600 or more. By participating in this Contest any announced winner grants AZTV permission to use the contestant’s name, voice and likeness for advertising/trade purposes without further consent or compensation to contestant. This Contest is subject to all federal, state, and local regulations and is void where prohibited. Any entrant who is discovered by AZTV or its sponsors to not be eligible to participate in the Contest shall have no legal or other claim to any Prize, whether prospective only, awarded but not received, or awarded and received. The determination of eligibility or ineligibility shall be binding on all persons who enter or seek to enter the Contest and is final. By participating in this Sweepstakes all persons who enter or seek to enter, whether or not they become Winners, agree to be bound by these rules and the decisions of the station and the sponsor and forever release and agree to indemnify and hold harmless AZTV, its sponsors, members, subsidiaries, parent companies and the officers, employees and directors of each of them from and for any claim, liability, expense, cost, income tax, loss or damage caused by or arising out of participation in this Contest and/or the receipt and/or use of any Prize. Odds of winning will vary depending on the number of qualified Entrants. Prize is subject to certain terms and conditions specified thereon and the terms and conditions of the event venue. AZVT and its sponsors are not responsible for anything beyond delivery of prize. If concerts or other ticketed events have been awarded as part of this prize package and the concert or event is postponed, rained out, canceled, or for other reasons beyond our control does not occur, AZTV and its sponsors will not be responsible for replacing that portion of the prize. AZTV and its sponsors are not responsible for any error, omission, interruption, deletion, defect, delay in operation or transmission, communications line failures, theft or destruction or unauthorized access to, or alteration of, entries or any other event that prevents timely receipt of entries. AZTV and its sponsors are not responsible for any injury or damage to any Entrant's or any other person's computer relating to or resulting from participating in this Contest or downloading any materials in this Contest. AZTV and its sponsors and their authorized representatives reserve the right to postpone, reschedule, delay, and/or modify the Contest dates, events and/or method of entry at any time. AZTV and its sponsors may be excused from their obligation to execute the Contest if their performance is delayed or prevented due to any cause beyond their control, including but not limited to acts of God, public enemies, war, civil disorder, fire, flood, explosion, labor disputes or strikes, and any acts by any governmental authority. By completing and submitting your entry, you agree to receive emails from AZTV. You may choose to opt out of these emails at any time. By entering the contest, entrant agrees to release and hold harmless all of the Contest Sponsors, prize providers, Facebook, each of their parents, subsidiaries, affiliates, partners, successors, assigns and all of the foregoing entities’ respective officers, directors, employees, talent, representatives, agents and shareholders, from and against any and all claims, causes of action, demands, losses or liabilities of any nature whatsoever (including without limitation, property damage, personal injury and/or death) which may result, directly or indirectly, in whole or part, from entrant’s participation in the Contest or with respect to the awarding, receipt, possession, use and/or misuse of the Prize or any part thereof. CAUTION: Any attempt by an entrant to deliberately damage the website or undermine the legitimate operation of the sweepstakes may be in violation of criminal or civil laws and should such an attempt be made, AZTV and its sponsors/partners reserve the right to seek remedies and damages (including attorney’s fees) from any such entrant to the fullest extent of the law, including criminal prosecution.